The season is in full swing; the sun is unrelenting, and summer beauty emergencies abound! Last year, I wrote a post about surviving summer beauty emergencies. 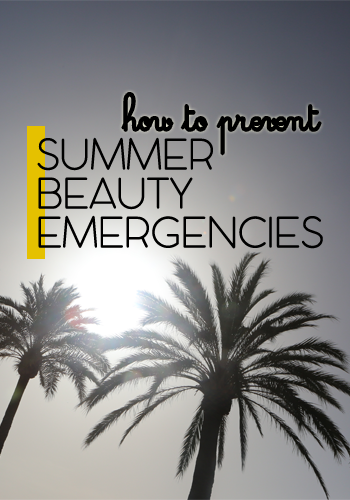 This year, I instead decided to write about how to prevent summer beauty emergencies before they even happen! The summer is notorious for causing frizzy hair because of the increased level of humidity in the air. According to Mo, the hair blogger behind Mo Knows Hair, frizz happens when moisture seeps in through your hair cuticles and swells the strands. Dehydration is the reason behind raised cuticles, which is why people with dry hair tend to experience frizzy hair more often. Therefore, the method to combat frizzy hair should be simple: hydrate your hair. However, the cause of dry hair in the first place varies from person to person, so the solution varies as well, but generally the following are the most common solutions that can help the majority: first, drink more water to hydrate your entire body; second, sleep on a satin or silk pillowcase to avoid rubbing your hair on drying material; and third, try these products to further hydrate your hair. In my previous post, I touted primer as your best bet against melting makeup, but in order to nip melting makeup in the bud, we need to understand what causes it, and the answer is oily skin. Sesame, the beauty blogger behind Viva Woman, summarizes that oily skin is caused by the overproduction of sebum in your skin. That, in turn, is caused yet again by dehydration. Your skin needs a certain level of natural oils to be healthy, and when that level is lower than it should be, your skin basically overcompensates by producing more oils. The reason for skin dehydration also varies from person to person, so the measures to be taken again vary. However, the general gist is that you want to return the level of natural oils in your skin back to normal, and you can do that by using a milder cleanser that doesn't strip your face or by using a light moisturizer. You can try these products. If you live in a place like Iowa, you learn rather quickly that you can get away with not shaving your legs for most of the year because they're always covered up anyway, so when warm weather rolls around and brings along with it an onslaught of revealing clothing (bikinis, eeek! ), you have to dejectedly pull out the dreaded razor. The obvious reason why shaving is such a chore is because hair grows fast, but another reason is how prevalent razor burns can be and how unsightly they are. The eponymous beauty blogger behind Miss Natty's Beauty Diary shares that razor burn is essentially caused by skin irritation. When you shave, your razor sometimes sloughs off a layer of skin with the hair, giving you the unflattering inflamed skin we call razor burn. Fortunately there are ways to prevent razor burn so that you can confidently dress your fine self in booty shorts all season long. First, contrary to popular belief, you shouldn't exfoliate before shaving. Yes, exfoliating does expose trapped hair follicles to prevent ingrown hairs, but exfoliating also removes dead skin cells, completely pitting a fresh layer of skin at the mercy of your razor. Second, throw away that dull razor you've been using for months! Ideally you should only use your razor cartridge for three or four shaves, but you can probably get away with double that amount depending on how well you take care of your razor. Third, use proper shaving products such as these. As is with most things, prevention is better than cure. Armed with these ways on how to prevent summer beauty emergencies before they happen, go forth and enjoy the rest of this warm weather! Which is your least favorite summer problem? How do you prevent or ease it?